Committed to the armed struggle: Pádraic Ó Máille TD, Kilmilkin, Connemara. The general election of 1918 was also a plebiscite on the Easter Rising, two years previously. The Rising, and the destruction of the centre of Dublin, had been generally condemned. The Irish Parliamentary Party, under John Redmond, had been inching towards Home Rule; why bother with such violence? The belief was that the men and women of 1916 were brave, if foolhardy. Yet following the prolonged executions of the leaders, the massive round up of participants, and their imprisonment in Britain, a change of attitudes swept the country. This was perfectly illustrated in the election held on a bleak December day 1918. Sinn Féin had fielded candidates in every constituency. The campaign was vigorous and tough. Galway was a good example of how feelings were changing. 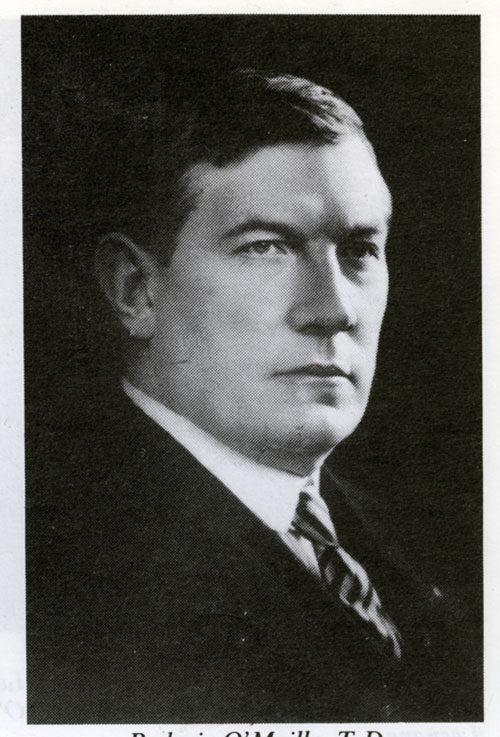 William O’Malley MP, from Ballyconneely, near Clifden, had been elected unopposed to the Irish Party on three successive elections. * In direct opposition to him was Pádraic Ó Máille, Sinn Féin, who had fought with Liam Mellows in the Galway Rising, had been imprisoned in Britain, and was now a committed nationalist. The electorate, however, thought otherwise. Over the whole country out of a potential 105 seats, Sinn Féin won 73. Ó Máille won by a whopping majority of 8,432. ***‘ Bonfires were lit in Clifden. Supporters burnt candles in their windows throughout the night. It was as much a victory over MacAlpine as over the Irish Party. At a triumphant meeting held in Eyre Square, Galway, Sinn Féin declared that it would never be satisfied with anything less than an Irish Republic; and ‘ if need be we’re prepared to fight and to die for it’’. Pádraic Ó Máille (1876-1946 ) came from a proud and independent family at the heart of the Maam Valley, Connemara. He was one of nine surviving children born to Micheál and Sorcha (nee Joyce ) at their farm Muintír Eoin, Kilmilkin. The O’Malleys were all educated at home. Pádraic’s father and uncles had hired a schoolmaster, Peaitsín Pheige, to educate their families, each paying him £10 per year. This continued until their landlord, the notorious Lord Leitrim, ordered them to discontinue Peaitsín’s employment. As a result the older children taught the younger ones until the family had attained a very high level of competence. Most of the younger generation of O’Malleys became doctors. To date 38 members of the family over three generations have entered the medical profession. By April 1921 Pádraic Ó Máille TD was fully committed to the armed struggle. The O’Malley home, Muintir Eoin, was a safe house, and the HQ for the IRA West Connemara Brigade under Petie Joe McDonnell. It was only about seven miles from the nearest RIC station, close to Maam Bridge, which was perhaps tempting fate to remain so close. Despite its ‘success’ in killing two RIC constables in Clifden the previous month, the brigade lacked fighting experience. Word came that a number of RIC constables went every week from Oughterard, by Screebe, to Costello to pay the pension to an ex-police sergeant, and to get poteen. McDonnell decided that this was a worthwhile target. He positioned his men on either side of the road, near the church, with instructions not to open fire until the last man came into view. Three constables and a sergeant eventually appeared. But without waiting for the last man to get close one of the IRA opened fire. McDonnell takes up the story:‘ I saw the sergeant diving off his bike for cover as I was looking for the man who had fired the shot. The policeman near me jumped into the drain, and he let his belt and his revolver drop and his rifle was on his bicycle. Jim King was behind a rock and was to join in with us when the scrap started. He was signing to me to know if he would fire, but I shook my head. The sergeant had only a revolver, for Gerald (Bartley ) got up and the sergeant fired and put a bullet between myself and Gerald. I saw the three other police with their rifles at the ready and I shouted to Gerald to open fire on them. We dropped and opened fire and they fell back. However a Black and Tan constable named William Pearson lay dead on the road. Next Week: A full scale attack on the O’Malley home at Kilmilkin. NOTES: * William O’Malley MP, no relation to the O’Malleys of Kilmilkin, was a well liked man. He had married Mary O’Connor an outspoken nationalist, who had served a prison sentence for Land League activities previously. They lost a son in the Great War. **Taken from Beyond The Twelve Pins - A History of Clifden and District 1860 - 1923 by Kathleen Villiers-Tuthill, published 1986, and still in available. *** Connemara and Galway city elected Pádraic Ó Máille; North Galway elected Dr Brian Cusack; South Galway elected Frank Fahy, and Liam Mellows was returned unopposed for East Galway. **** The youngest brother, Conor O’Malley ( 1889-1982 ), followed a typical O’Malley trail. He studied both engineering and medicine at UCG, served as a medical surgeon in both the Royal Navy and the RAF; practised ear, nose and throat surgery in London and Galway hospitals, became the first radiologist at Galway’s Central and St Bride’s hospitals; and became professor of ophthalmology and otology at UCG. He founded the Order of Malta here, spent holidays working in India among the poor, and enjoyed fishing, publishing a still much loved book: With a Fishing Rod in Ireland in 1976. ***** Taken from The Men Will Talk to Me - Galway Interviews by Ernie O’Malley, published by Mercier History, on sale €19.99.